Whether it's the warm weather, jobs or cheap cost of living, these are the top 10 cities Americans are moving to, according Penske Truck Rental's annual list. Even though it was hit hard by the recession, Atlanta has claimed the top spot on Penske's list for four years running. Home to Coca-Cola, Home Depot and roughly a dozen other Fortune 500 companies, the city offers a range of job opportunities. And the cost of living is pretty cheap — less than half the cost of Manhattan — with much warmer weather (well… except for this winter). Housing in tech hubs is expensive. Just ask anyone in California. Home prices are in fact 82 percent higher in tech hubs than in other large metros, according to a report from Trulia. What is surprising, however, is that technology may not have contributed to that huge disparity, at least according to Trulia's chief economist Jed Kolko, who sifted through Census data to make his arguments. "Housing in tech hubs was expensive even before the modern Internet era," noted Kolko. "In 1990, median price per square foot was 52 percent higher in tech hubs than in other large metros." 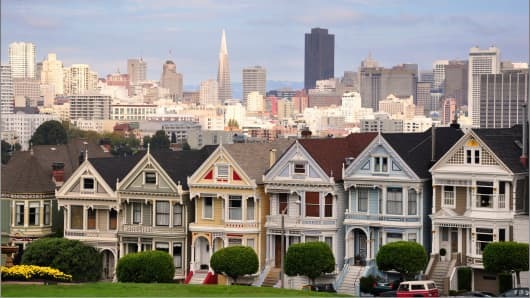 Victorian houses with San Francisco skyline. So the tech industry didn't push prices higher. It was drawn to places that were already expensive. This may have been because these areas had major research universities, technically skilled workers, computer manufacturing industries or nice climates. Kolko points out that the year-over-year increase in home prices in tech hubs is actually in line with, not ahead of, the national trend; that is, after one accounts for the local severity of the housing bust. Still, there has been growing animosity, in San Francisco especially, that the influx of workers from Google has made the city increasingly unaffordable. Affordability actually varies pretty widely among the top 10 tech hubs. Just 14 percent of homes in San Francisco are considered affordable (based on median metro household income) compared with 60 percent in Raleigh, Bethesda and Washington, notes the Trulia report. The reason San Francisco is so expensive may not be the high-paid tech workers, but a far more old-fashioned scenario: too little supply amid high demand. "Since 1990, there have been just 117 new housing units permitted per 1,000 housing units that existed in 1990 in San Francisco," Kolko said. "That's the lowest of the 10 tech hubs and among the lowest of all the 100 largest metros, even with the recent San Francisco construction boom." Other tech hubs, like Raleigh and Austin, have 10 and eight times as much construction, respectively. The Bay Area's tough geography and regulatory environment have pushed development prices higher, limiting construction.